I'm 13 years old, visiting my grandparents, and we're all sitting down to lunch. Today, we're having stew. My uncles are here, my parents, one of my cousins. It is familial bonding at its best: over food. My plate gets passed up the table to my grandmother, who takes it, looks at me, then turns around and fills it with something from behind her. As she passes it back to me she says: "I'm giving you salad because you're getting too fat." My whole family snort into their stew, giggling, bar my mum who pats my arm reassuringly and makes defensive noises. It's a bit mean, I suppose. But she did have a point, I was getting fat and my grandmother is honest to a fault. Like most Romanians. I'm Romanian, you see. Born there but raised in England since I was five; both my parents are Romanian, though when my mum married my English stepfather I took his name. So now I'm a Jones with a muddled English accent – a bit northern to the southerners a bit southern to the northerners. I say "like" too often and have seen every episode of Friends a bajillion times. Until a few years ago I was a relative oddity. 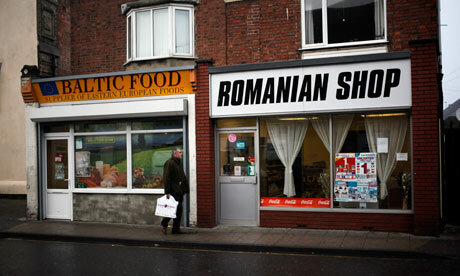 There just weren't that many Romanians around. I grew up fielding questions like "is Romania in Africa?" or "don't Romanians live in caravans?" (No, and you're thinking of Romany.) I suppose I liked it, being different. I liked that I could speak another language and had an exotic story to tell. Of course I was teased, but then aren't all kids for one reason or another? And if I ever encountered a "go back to your own country", I'd write the person off as a bigot or a simpleton. Oh how times have changed. In the past year a new story has surfaced nearly every day about gangs of Romanian grannies squatting in public squares, stealing or begging or causing a nuisance. This week the Times ran a piece about a tsunami of criminals rinsing clean the jacket pockets of western Europe then hopping on the next Wizz Air flight back to the homeland to spend the spoils on Samsung tablets. It's as if petty crime didn't exist before six months ago. An insidious sort of hysteria has taken hold and it is open season on Romanians. So I find myself in a strange position because I don't like these criminals, and I think that they deserve to be punished; and yet when I say that, people assume that I'm sanctioning the rubbishing of Romanians. I'm not. It goes back to my grandmother banging that salad down in front of me. She was honest, despite the fact that it might have hurt my feelings – as with most Romanians honesty is a big deal to her. She is also hard-working, thrifty, funny and an excellent cook. She is, again, exactly like most Romanians in her abhorrence of crime and her anger at the minority who are ruining Romania's reputation. In the great Venn diagram of the world there is one circle for Romanians and there is another for criminals. Both circles are vastly bigger than the area they create when they overlap, but it seems like only that relatively small area is of any interest to the media. And so most of the time, I'm just a tiny voice bleating saccharine sentiments about family and honesty and noble immigrants in a shitstorm of press, all determined to tell one story and tar the whole circle with one brush. My grandmother's advice? "Don't bother; no one wants to go to Britain anyway."